French artist Jean Dubuffet (1901-1985) worried about his talent. Though he studied at art schools in Le Havre and Paris, he was insecure about his abilities. Yet he saw that the drawings of children had a simple profundity and patients in psychiatric institutions could take radical liberties in art. 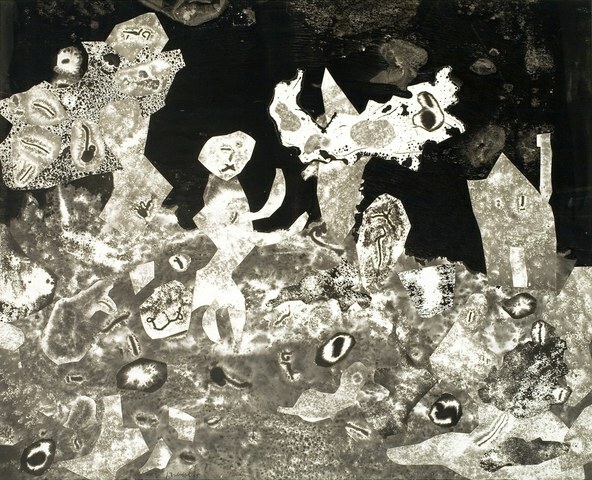 Once Dubuffet saw his own liabilities as assets, his art gained a unique power. One hundred excellent examples of his lack of skill turn out to be one of the best exhibitions in LA: Dubuffet Drawings: 1935-1962 at the Hammer Museum. Originally organized by the Morgan Library in New York, where the Dubuffet archive is held, and presented here by Hammer curator Cornelia Butler, the show fills a gap in the usual understanding of the work of this important artist. Dubuffet coined the term Art Brut to describe the art of the insane, which he used as the basis for his rough stick figures made by thin lines slashed into the paint on canvas. The immediacy that he sought to achieve, however, is most dramatically seen in his drawings, something Dubuffet himself believed. Because they could be done quickly, they represented little pause between thought and action, between what was seen and what was conveyed. Immensely popular with collectors and fellow artists in the 1940s and 1950s, Dubuffet’s art lost some of its popularity during the changing tastes of the 1960s. 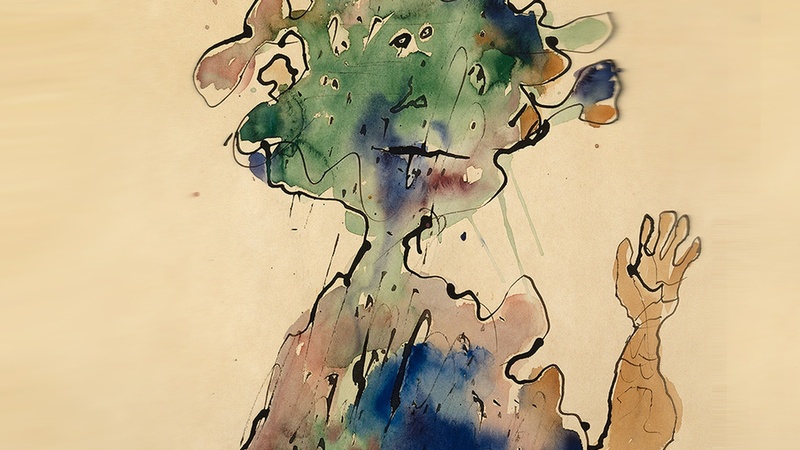 Yet, numerous contemporary artists — Mike Kelley, Paul McCarthy, Thomas Houseago, (now in a show at Gagosian ) — have responded to Dubuffet’s spontaneity and raucous subject matter, his "Corps de dame" ink drawings in particular. Dubuffet was friends with artists like Fernand Léger and dabbled in making his own art in the 1920s and 1930s but mostly he operated the family wine business. 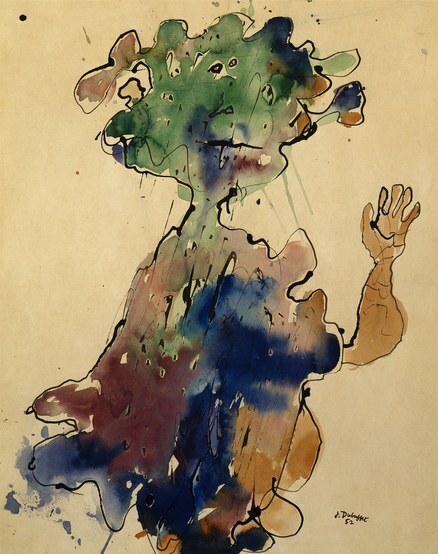 His ideas about the possibility of a different approach came from Hans Prinzhorn’s 1924 book Artistry of the Mentally Ill.
After 1942, when he decided to devote himself completely to his art, children’s drawings were his initial source material, less for their innocence than their awkwardness. He did drawings of travelers on the Metro, riding in the cars, waiting on platforms. A trip to the Sahara resulted in scores of colored palms, desert landscapes. It was his trip to psychiatric hospitals in Switzerland that reawakened his earlier interest. Portraits of friends, mostly writers and artists, were almost caricatures in their bold simplicity. 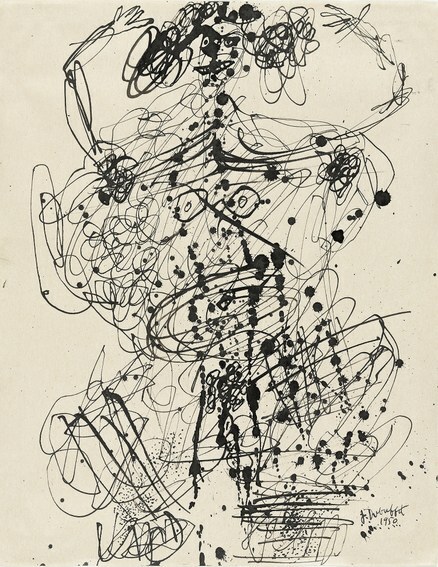 As a result of looking at so-called outsider artists like Adolf Wölfli, some of Dubuffet’s compositions from the 1950s are entirely covered with obsessively detailed marks, serpentine lines based on the practice of automatism pioneered by the Surrealists. His assemblages of imprints are mesmerizing in the intricacy of their making and the delicacy of composition. One series is made with the wings of butterflies that he captured while in the Alps. 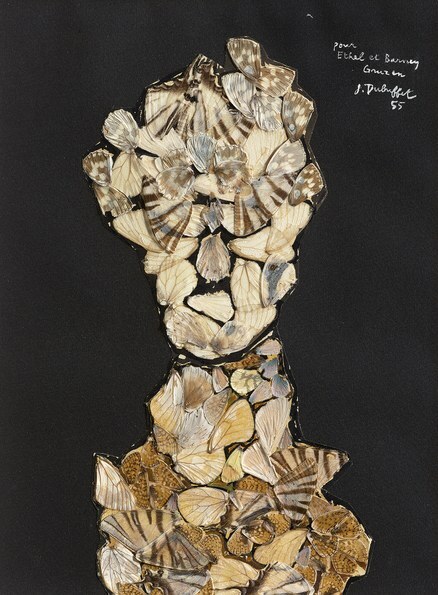 Dubuffet also placed flowers, leaves and seeds atop an inked-based paper and gained impressions by placing more sheets on top. These imprints were torn into tiny pieces and reassembled into landscapes, portraits or faces with huge beards. They are dizzyingly delightful. The new galleries, designed by Michael Maltzan as part of the master plan to reorganize the museum’s interiors, make a gorgeous environment for these works. Walls are painted a blue-toned gray to support drawings of mostly modest size. It is a not to be missed exhibition, perfect in fact and form. It is on view through April 30.